Progress 8 and the new GCSE grading system. According to the Jackson 5, it should all be that easy. However, many parents are still getting to grips with the new grading systems that were implemented for the GCSE and A Level exams. Instead of A* to G, the system now runs 1-9. In the Progress 8 grading system, students are assessed using 1 to 9, where 1 is the lowest achievement and 9 is the highest. The Office of Qualifications and Examinations Regulation (Ofqual), the non-ministerial department that regulates all the qualifications, examinations and assessments in England, has published this to explain the differences. At the moment, a “standard” pass is a grade 4 and a “good” pass is a 5. However, there is a warning that the 4 grade will only be measured as a “standard” pass during this period of transition into the new grading system. It is proposed that by 2020, the 5 grade will be the pass mark and 4 may no longer be included as a pass. How will the transition period affect my child? Senior examiners will then look at marked papers at these boundaries to confirm that they accurately reflect the level of performance and use it as a reference point to allocate the rest of the grades as higher or lower in terms of achievement. The other grade boundaries will be positioned between these, so 5 and 6 will be equally placed between 4 and 7 and so on. They are also utilising comparable outcomes to stop students being disadvantaged. This means, they examine the statistics provided on year group achievements from previous years and if there are similarities in those groups, they would expect similar results again. According to Ofqual, “schools have responded well to the reforms” and so that is something to feel very positive about. Logging into the activities available at Your Favourite Teacher will highlight how we have tailored our approach to compliment the learning your child acquires at school. We have already embraced the change in the grading systems and are here to provide all the support you need during the transition period. So, why did the government change from the old system? Statistics suggested that the old system did not distinguish between students of different abilities enough. For example, those on the C/D border might scrape a C but it wasn’t an accurate reflection of what they were able to do in that subject. The same could be said for the A/B border, where students might not have tipped into the A category because there may have been too much focus on getting the C/D students over their line. Nicky Morgan, the former Education Secretary that led the change, said the new gradings would “push each pupil to reach their potential”. The idea is that every student is now challenged and their result will reflect their ability to achieve. Schools across the country have already started using the Progress 8 gradings in years outside of GCSE so that students and parents alike get used to what the boundaries are and what that means in terms of achievement. In reality, the accuracy of these boundaries is only applicable to GCSE and A Levels. Students in Year 7 don’t achieve at GCSE level yet, so they can’t accurately be graded as a 5 or a 6. However, schools seem to be using the new grading systems as a guide and are adjusting them to suit the different year groups as a way to ease everyone in. That way, by the time their students start taking GCSE exams, they are already aware of their achievement levels and what they mean. Well, one of the main changes in the new way of examining students is that they get one grade at the end, rather than a series of module grades that add up to a final grade over the two years of GCSE. This can be quite daunting for a teenager as everything seems to hinge on how they perform in their exams. The school has probably provided a prediction of where your child’s achievement currently stands. As parents, it can seem instinctual to want to fix everything. Alas, exams are something your child has to do for themselves but you can support them by listening to their worries and working out strategies to help reduce their anxiety. These include planning when to revise, ensuring they take breaks during revision, cut off their access to sugary, highly caffeinated drinks, make sure they have healthy snacks and so on. Most importantly though, you can talk to them about what they feel they are missing. Do they want quizzes to check their learning? Would a video explaining the questions help them understand what they need to do? Here at Your Favourite Teacher, we have lots of resources available, ranging from revision exercises to activities to support and challenge them in order to build their confidence for the exams. We are here to plug any gaps they may feel they have in their learning so that they are the most prepared they can be. The Progress 8 system is new and is designed to challenge students more. However, that need not be a negative thing and, as parents, maintaining a positive attitude towards the upcoming exams will influence your child to feel the same. Don’t focus on the possible magnitude of what they are facing. Instead, focus on what they can do. What steps can they take to fill any gaps in their learning? This will help you to support them in navigating the way the grades are distributed and give them a sense of control over the process. So, it’s not all quite as easy as A,B,C but it isn’t hopeless either. The exam boards are actively avoiding disadvantaging students during the exams and that is fantastic news for all. Have a look at everything we have to offer. 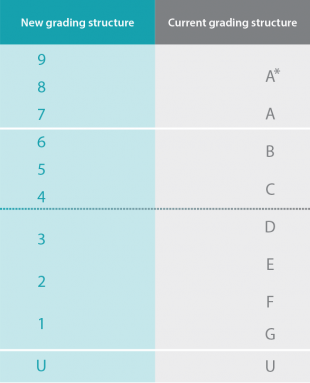 Ofqual also have a blog to keep parents up to date with the new grading system.